Kerwin Walton, a 6-foot-5 junior guard from Minnetonka (MN) Hopkins, is ranked as state’s number five player in the Class of 2020 and one of the state’s top outside shooters. Walton is averaging 16.1 points per game for the Royals, who are off to a 15-2 start. He missed their season-opening 74-65 loss to East Ridge, but Walton has scored in double figures in every game since. He has 20 or more points twice, with 21 and 25 points versus Minnehaha Academy. Gopher Hole caught up with Walton recently to learn the latest on his recruitment, including a Minnesota offer and junior season. Gopher Hole: What are the expectations for Hopkins this year? Kerwin Walton: Our expectations right now, are to win state and hopefully, I believe, we can do that, especially if we all come together and play together. Gopher Hole: Last year, you had a great year and were 26-1. Unfortunately, you got knocked off by Wayzata in the section finals. Is that going to give you even extra motivation to get to the state tournament? Kerwin Walton: Oh, yes. Definitely. We are not really focused on them, but that definitely gave us a whole learning lesson for how we should approach the game, especially coming into sections and then hopefully, we make it onto state, which I do believe we can make it. Gopher Hole: You lost some key players like Joe Hedstrom, Blaise Beuchamp and Anthony Davis. How do you see your role changing from last year to this year? Kerwin Walton: Especially, from what the coach told me, it is definitely going to be bigger. I am really going to have to step up and be a leader and I am going to have lead my team to the state championship and hopefully, I can live up to all the things that coach wants me to do. Gopher Hole: You had a good season last year as a sophomore, but I think your interest in terms of recruitment really picked up based on how well you played AAU-wise this spring and summer. How pleased were you with how well things went? Kerwin Walton: I was really happy with how things went, especially since it was really my coaches who really helped me. They really believed and thought that I was good and they actually helped me put in the effort to make sure I’m getting what I need and especially my parents. I really think that the AAU season has been a great stepping stone for me in coming into the high school season, because everyone is starting to knows me more. Gopher Hole: It seems your confidence level even picked up when I watched you AAU-wise. You seemed more confident, knowing that you could do things out on the court. Do you think that is definitely is going to carry over to the regular season? Kerwin Walton: For sure, because usually when I get more attention or even just people in the background just motivating me and giving me more confidence because I know that they have my back. Gopher Hole: I know that you are only a junior, but you have picked up some offers. How many offers are you up to right now? Kerwin Walton: I have about eight. Minnesota, Baylor, Purdue, Kansas State, Drake, South Dakota, Denver and Creighton. Gopher Hole: That has to make you feel very proud, getting that type of interest already going into your junior season? Kerwin Walton: Really honestly, it is great to have all the interest and offers, but like what one of the coaches from Creighton told me “I’m getting all attention, but I can’t hit the brakes now,” I have to step on the gas pedal and really push hard. This motivates me to work even harder, especially getting all the attention that I have. Gopher Hole: What things have you really worked on hard during the summer to really improve yourself as a player? Kerwin Walton: Mostly the psychological game. Coming in, feeling hungry and motivated. Also, my athleticism, being able to guard and sit down on someone. That has also been a big key for me and mostly, just really leadership. That is probably my biggest thing I’m really hoping to improve on, even though I know that I have it in me, because I see myself as a natural leader, but I really think that my leadership can really go through the roof, especially if I focus on winning. Gopher Hole: You are junior this season, an upperclassmen. Is that a weird feeling being a junior finally? Kerwin Walton: To be honest, not really because I see myself as a high schooler. When I play against people, I don’t see them as juniors or sophomores or underclassmen. I usually just see them as the other team and regardless of age or grade, I feel like it wouldn’t really matter when it is all said and done. It’s whoever can get the job done. Gopher Hole: Obviously, you have a lot of great offers already. What would it mean to play Division I basketball? Kerwin Walton: To me, it is going to be another step to the next level. Hopefully, when I do play Division I, I play a lot and I develop a whole lot, like I get a lot better in college and D1 level and hopefully, I can even go further than that. Gopher Hole: You are hearing from the Gophers. They offered you a few months ago. What would it maybe mean to have the opportunity to play for the homestate school? 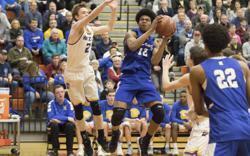 Kerwin Walton: It would be really cool, considering I would get some good props from people in Minnesota, but I’m not really having any favorite schools or anything, but right now, I am just focused more on the high school season. Gopher Hole: Obviously, you have a ways to go with your recruitment, but what are going to be the main factors that are going to make you pick School A over School B or C? Kerwin Walton: Honestly, if it is just the best situation for me. A situation where I can really develop and take a whole other level. Be able to get much better in that system of how the college plays.